Since our trip is coming to an end, and we are flying back tomorrow today was the last day we could attempt a full day adventure. After the washout yesterday we were thinking all previous night which one to choose. 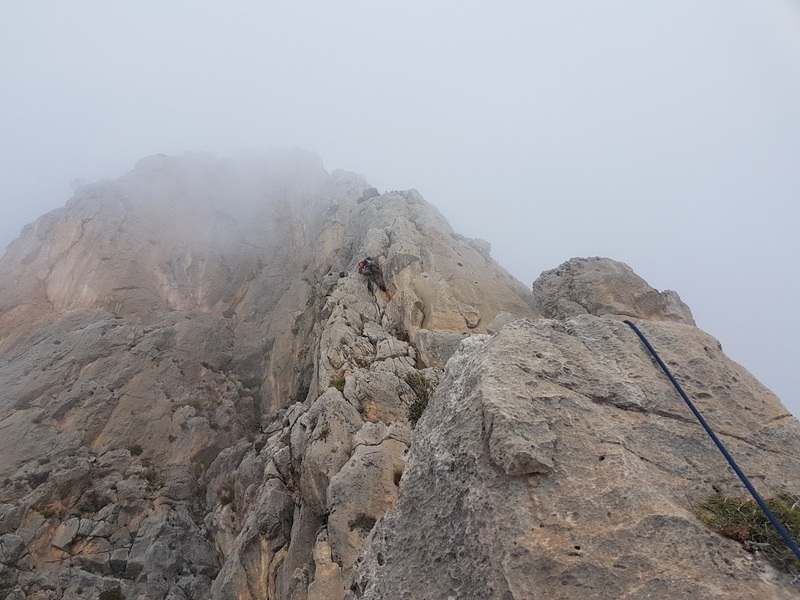 To add to these problems (of the good kind) with selecting a route, a bad problem returned – Gerard ankle wasn’t in good condition and he opted to sit the day out and perhaps return in glory tomoreow. 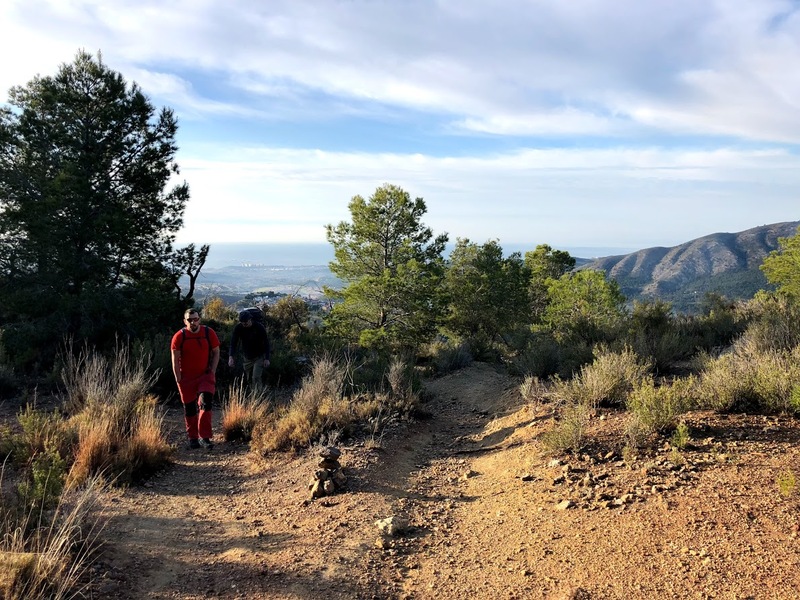 We finally decided to do a local mega classic – Espolon Central route on Puig Campana. 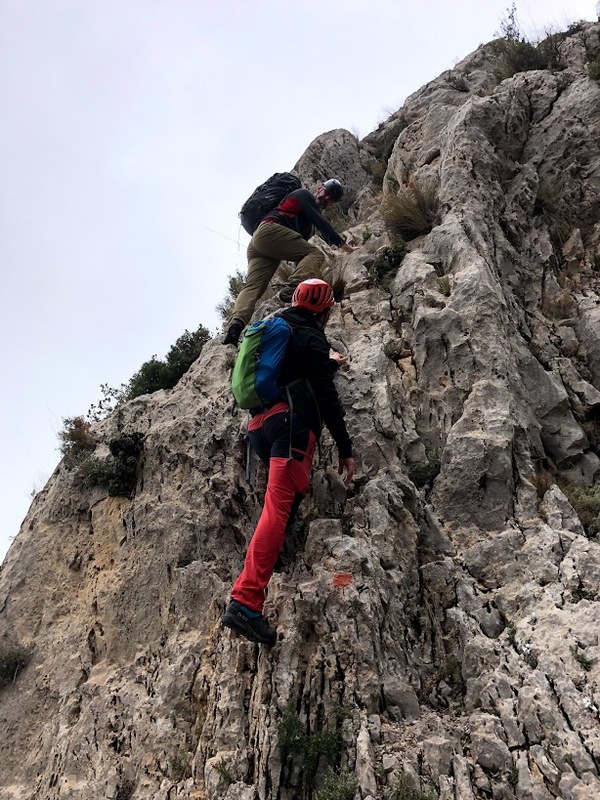 One of the best known rock features of the Costa Blanca, our route took us 13 pitches via long slender ridge of the massive overlooking the village of Finestrat. Our today’s objective, with the route marked in red. 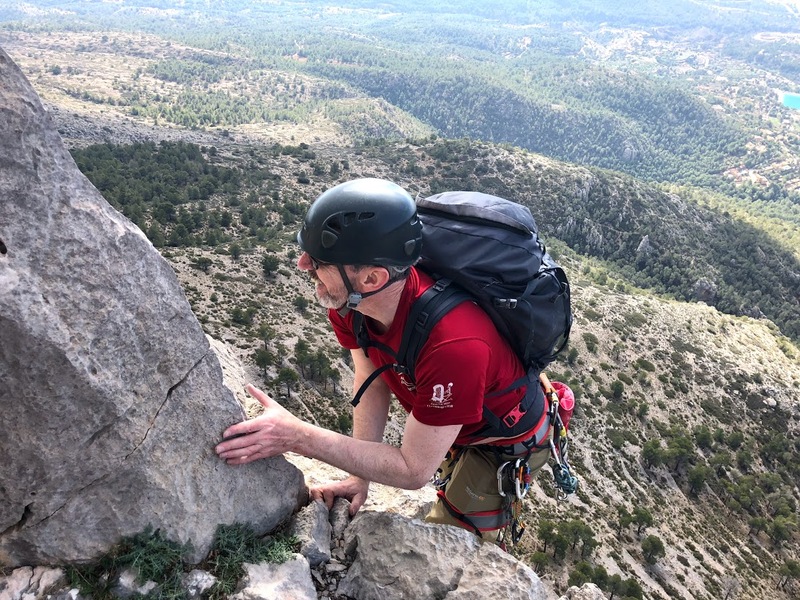 The route is graded HS 4c (although some give it 5+, depending on the choices you make on some pitches), and while technically it is not hard, the difficulty comes from its size (430m of climbing), exposure and the tricky descent. More on that below. The three of us left the car at the side of the access road and set of around 8.50am. The approach is a scrappy and steep walk up via set of terraces. 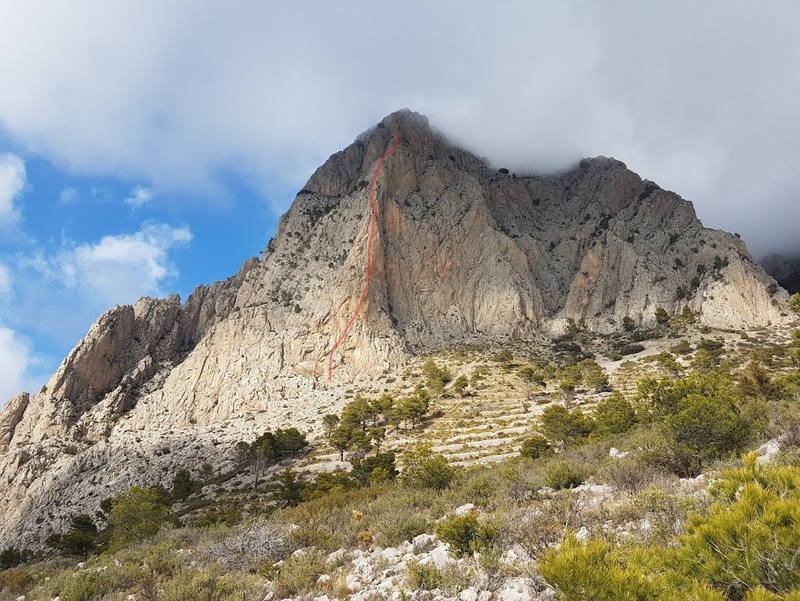 It’s really easy to loose the path, but it’s not hard to get to the base of the route itself as it’s just massive and clearly seen from any point of the approach. Once we got to the base, as it seems to be a tradition by now, I quickly racked up and claimed the first, very easy this time pitch. Me leading P1. Picture: courtesy of our resident free-soloist Peter “Honnold”. 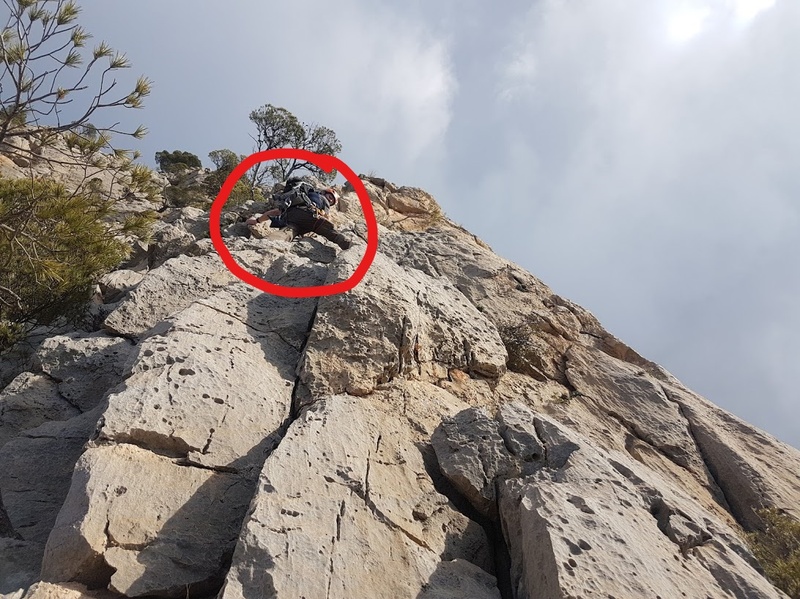 At that point Peter, who actually climbed this route twice before (he has been in the area multiple times) decided he wanted to free solo some of the pitches (he ended up going rope-less for 10 out of 13 sections). At this point I should mention that on long routes like that sometimes the nature calls, and there is nothing else one can do than just do it. Peter and I were crammed on a small ledge, with Seamus following, so I just pulled my pants down and did what had to be done. Someone once said that in moments like that you have two types of friends – the ones that will turn their head and give you a moment of privacy, and those that will pull their camera out and take a photo. I’ll let you guess which type Peter is. 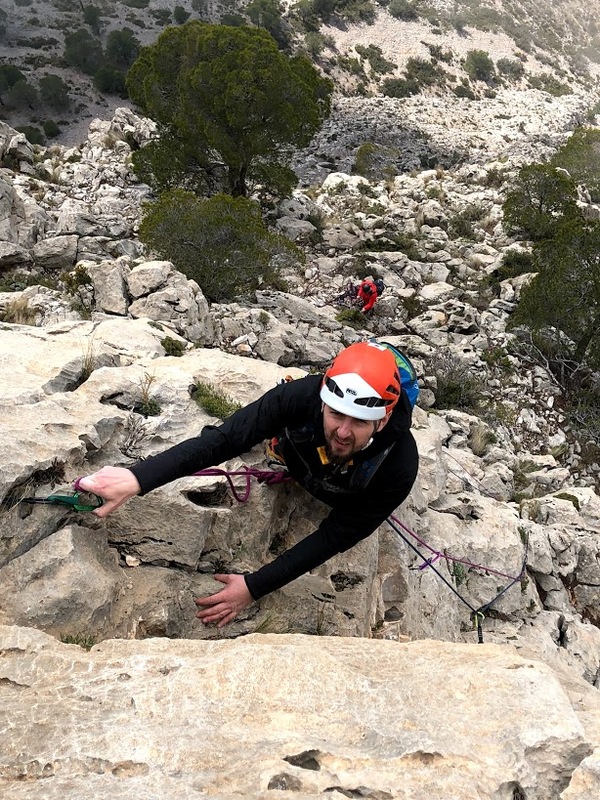 Anyway, we more less followed the route swapping leades with Seamus and having Peter occasionally join us (although when he did rope up he barely put gear in anyway). I won’t go into pitch by pitch description, you just need to know that there is no drama, but route finding can be tricky at times (as it usually is on long outings). For gear, we only had 3 small cams and handful of wires, but as I said, route was fairly easy, and we tried to go as fast as we could anyway (which meant running it out often). Forecast had rain after 3pm and it wasn’t uncommon for people to get stranded on the mountain overnight. Seamus on a lead. Still in a tshirt, I think this was pitch 5 or 6. Pitch 8 marked lunch, and also was a place that marked point of no return. Abseiling from above it would be very hard. Peter on P7 (leading to the lunch ledge). It was one of the few ones for which he roped up. Not sure why, as the 1 piece of gear he put on it wouldn’t do him any good anyway ;). 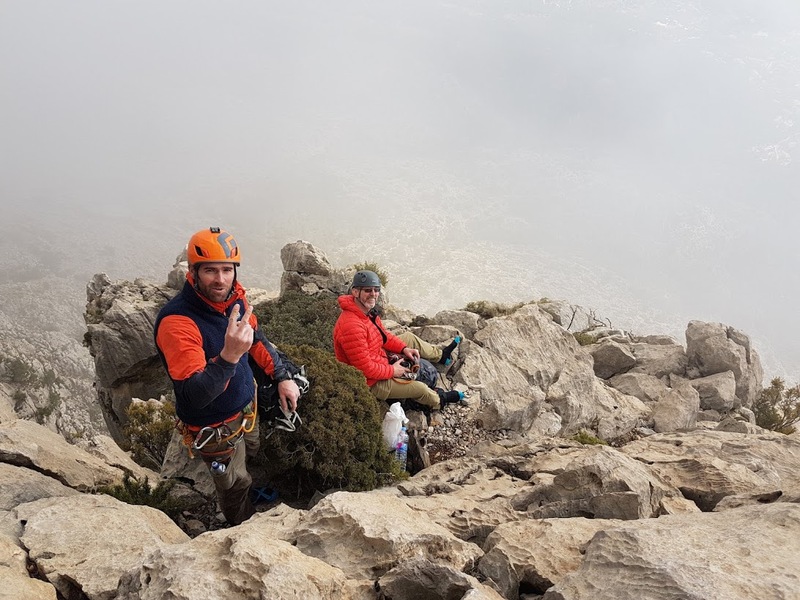 We were on schedule and moved on for the last 5 pitches, knowing that after we reach the end of the route there is a lengthy and exposed walk off waiting for us. Totally not posed photo of me clipping rope. Leading out of Pitch 8. The upper pitches went surprisingly fast, especially that it got quite cold. We actually all put all of our layers of clothing on, as the cold cloud covered the mountain. Quite a change from tshirt ground level. Victory top photo. Peter showing how many hours it will take to get down now. 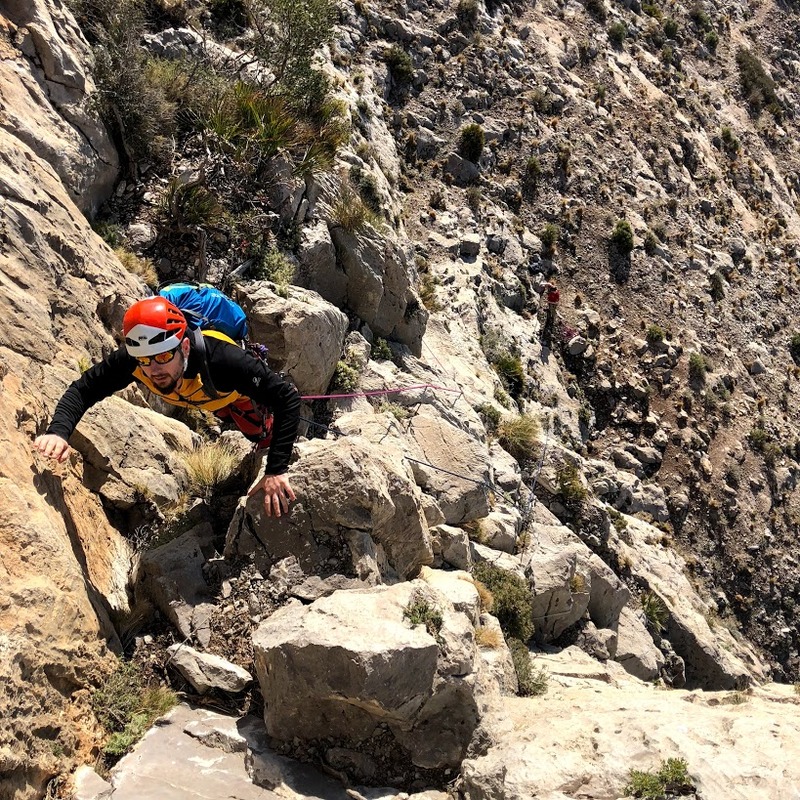 The descent is a quite long and sketchy traverse towards a scree gully. It has some fixed wires and many down climbs in M to Vdif variety. Start of the walk off, with fantastic views of surrounding areas in the background. One dodgy step can have serious consequences, so since we weren’t strapped for time (the big cloud that arrived didn’t produce rain), we took our time. Climbing down. Quite few of these donwclimbs are very exposed. We were by the car around 4.20pm. So car to car in 8 hours for a party of 3 of middle aged man is quiet decent. 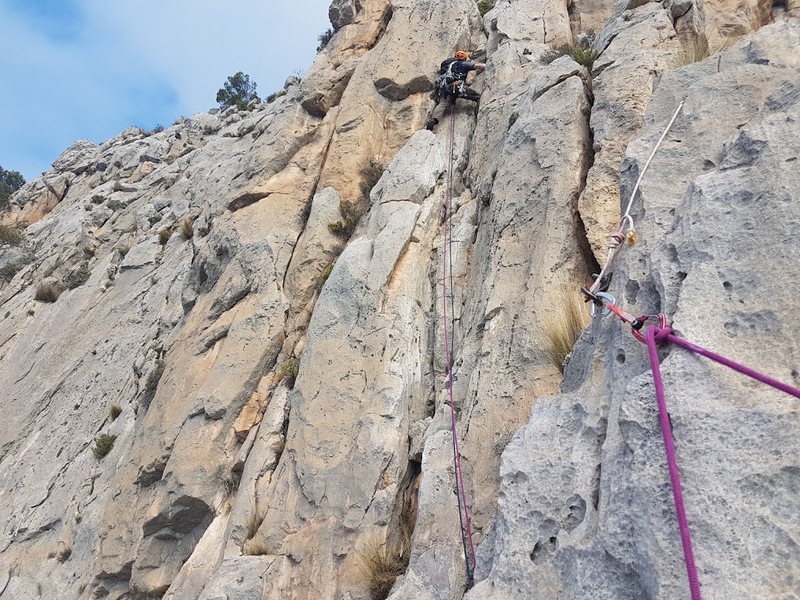 I honestly have to say that this is one of the best multipitch routes I’ve done and if not for terrible descent, it be a great for all climbing enthusiasts, but because of that I would only recommend it to the adventure seekers. 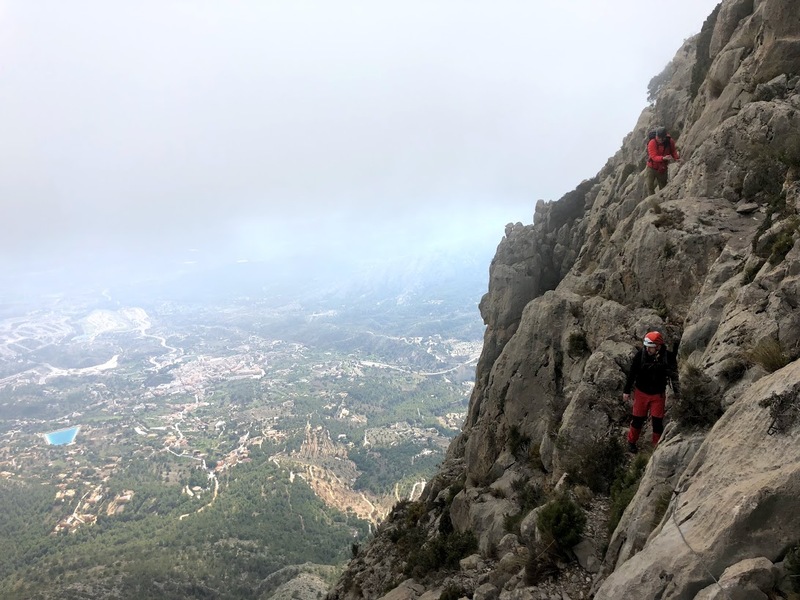 Tomorrow we are flying back home, but we will definitely visit one more crag (Most likely a neighboring Sella) for some pre-flight single pitch fun.